Last Saturday i had the pleasure to speak in an event of the NET Community, a Portuguese community based on Microsoft technologies and one of the Communities with big expression on the Portuguese Technological panorama. Was very good to see a lot of people in a sunny saturday morning hungry of technical knowledge and trying to learn more. This kind of meeting use to have two presentations last Saturday the first presentation was about ASP.NET performance and the second was my presentation about Windows 8.1. 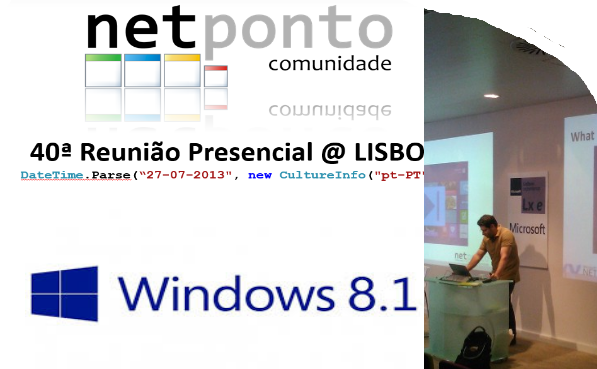 Was very good to be back to the community and spend a morning showing some off the news and steps to learn Windows 8.1, by the way this was the first public presentation in Portugal about Windfows 8.1, NETPonto was the first to bring a event to Portugal to discuss the next steps of Windows 8 Book. If you pass in Portugal in a NetPonto meting day i suggest you to pass there to know some good and motivated Portuguese developers and architects, here goes the link to the community site http://netponto.org/. Many thanks to the NETPonto organization for the opportunity and the audience for the fantastic reception , to the audience i will be waiting to see your skills growing and to see your apps on the store. As some of you know i had been studying and experimenting Windows 8.1 from a Ux prespective a Development Prespective and a IT prespective. I have already in the agenda the launch of my first Windows 8.1 store app, and i will be speaker in two presentations about windows 8.1 between July and Agust. Here you have all the instrutions to start playing with Windows 8.1. Soon i will start posting the result of my 3 month experiments and studies and the conferences and KB i get along the way.